1 small segment at waist point (pedicel). Queens over winter in soil. The eggs are laid in late spring and the larvae hatch 3–4 weeks later. 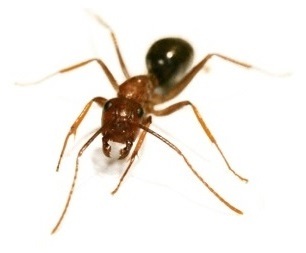 Larvae feed on secretions from the queen’s salivary glands until the first worker ants emerge. Worker ants continue with larval care, nest building and food foraging. Foraging worker ants follow well–defined trails around food sources. Sweet foods are preferred but high protein foods will also be taken. Swarming characteristics – mating between queens and fertile males takes place on the wing during late summer and the males perish after mating. Nest locations – often outdoors in soil and below paving slabs on the sunny side of buildings. Nest locations can be identified by the presence of finely powdered soil around nest exit holes. Workers 1.5–2mm long, yellow–brown with brown abdomen. Males 3mm long, black and winged. Queens 3.5–6mm long, dark red in colour with wings. Black eyes. 2 small segments at the pedicel. Swarming characteristics — new colonies are often formed through nests that have been disturbed e.g., as a result of insecticide spray treatments. Each queen produces up to 3500 eggs in its lifetime.